"To the family of Mary Johnson Jones: May the God of all..."
"Our deepest condolences to the entire family. Please take..."
"Mary will be forever remembered in my family for her good..."
Mary "Shug" Jones passed away peacefully on Tuesday, January 16, 2018 at Prevost Memorial Hospital, Donaldsonville at the age of 97. Visitation was held Saturday, January 27, 2018 at Greater Mt. Pilgrim Baptist Church, 927 St. Patrick St., Donaldsonville 9 a.m, until religious services at 11 a.m., officiated by Rev. Timothy Campbell, Pastor. Burial in Protestant Cemetery. Mother Mary leaves to cherish her memories five daughters; Mary Batiste, Elizabeth "Liz" Jones, Margaret (Lawrence) Smith, Janice (Lloyd) Bernard, all of Donaldsonville and Victoria Landry of Gonzales, thirty-eight grandchildren, four of whom she raised; Darlene Landry, Deidre Jones Kenny, Byron Jones and Crystal Jones, sixty-two great grandchildren, three of whom she raised; Tyrone Jones, Byron "B.J." Freeman and Terrance Hilton, Jr., an adopted daughter Brenda K. Rome, other relatives and friends. 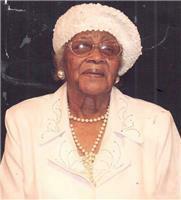 She was preceded in death by three sons; Lionel Jones, James Willis, Jr. and John H. Jones, her parents; Wilbert and Victoria Johnson, sisters; Juanita Motton and Leola Garrison, brothers; Wilbert Johnson, Jr., George Hardy and Charles Johnson, two great grandchildren; Chineka Smith and Constance Carcisse. Arrangements entrusted to Demby & Son Funeral Home. Please visit www.dembyandson.com to sign the guestbook.